The rock art panel at Ballystokes is 2metres long by 1 metre wide and is inscribed with bronze age petroglyphs. 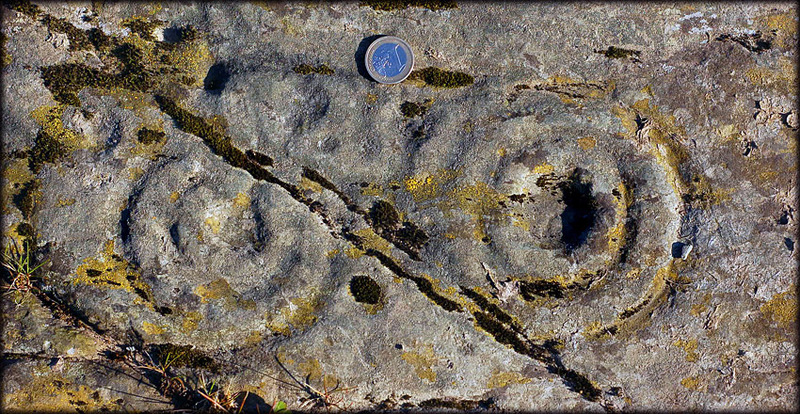 These petroglyphs feature many cupmarks and also cup and rings, the largest of these is shown in the image left with a euro coin for scale. Most of the scribing are towards the west of the outcrop and are very weathered, I regret not having brought water with me, which may have brought the motifs out a bit more. The western side of the panel points toward Slieve Donard in the Mourne mountains. There is another piece of rock art at Churchtown less than five kilometres from here. Situated: Easy, From Downpatrick take A25 north west towards Strangford, after 1 about kilometre take a right turn for Saul. This is Mearne road, drive over 5 kilometres to the end of this road, the last kiometre is narrow and signed cul-de-sac. Park here and follow the way marked sign to your right, passed the farmhouse in the image shown right. Go over two styles and follow the track, it leads straight to the inscribed panel. Discoverer Map 21: J 5258 4577. Last visit Apr 2008.